Born/lived: England/Troy NY, New York City. Known for: painting landscapes, murals and designs on Steinway grand pianos, and musical instruments. Studied: South Kensington Museum, London. Exhibited: Society of Independent Artists. 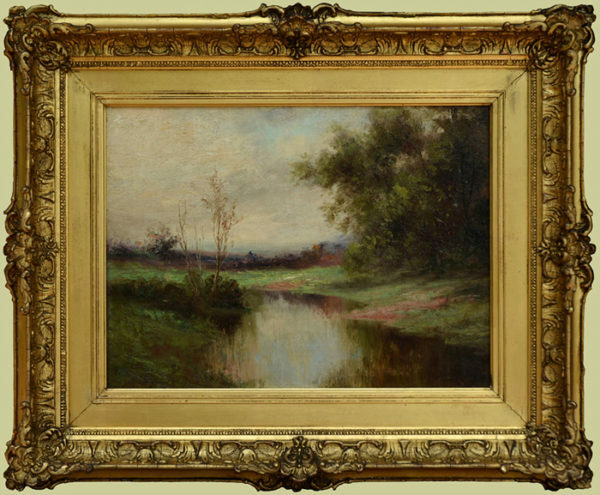 Artist First Name Arthur E.
Comments This painting has an original Salmagundi Club label verso. This painting is in excellent condition in a beautiful, original period gold frame also in excellent condition.Born/lived: England/Troy NY, New York City. Known for: painting landscapes, murals and designs on Steinway grand pianos, and musical instruments. Studied: South Kensington Museum, London. Member: Salmagundi Club. Exhibited: Society of Independent Artists.